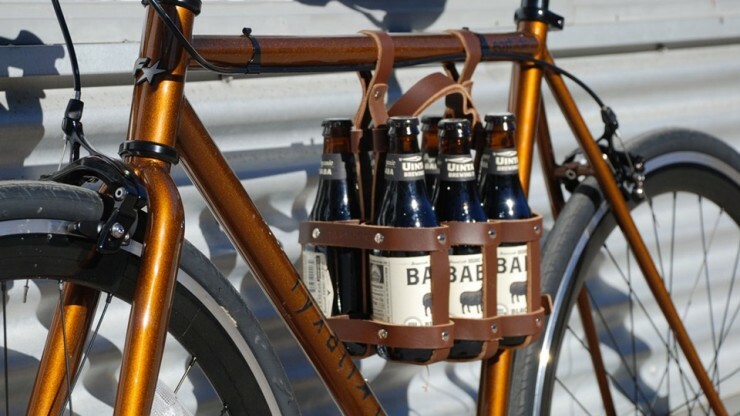 Leather Beer Caddy For Bikes | OhGizmo! By David Ponce on 08/26/14 • Leave a comment! Making a beer run in the middle of the party can get annoying, but not so with the Fyxation Leather Bicycle Carrier. Instead of stuffing that six-pack in your backpack or bringing it back (gasp!) in your hands, just put the beers in this cool-looking brown leather carrier. It’ll fit right beneath your top post, making it super convenient. Ok… we’re sure some of you will complain that you have to take the extra step to remove each beer from its box and individually insert it in this carrier. It’s true… but just look at it! If you don’t have a backpack, this is still the superior option. But hey, if you’ve been drinking, maybe it’s better to walk after all? Cycling while intoxicating is no better than driving, so be safe. The caddy will cost you $57, from Amazon.